Whether your event is large or small, Summers Mill can meet your needs. Our two large meetings spaces can accommodate between 100-150 people. Our additional meeting rooms have various options for the perfect meeting space. Call us at (254) 939-6194 for more information. Audio is presented through a distributive system of ceiling-mounted speakers. This is a multi-purpose facility that is well suited for many different activities. This meeting space is designed and furnished with rustic elegance. It is one of the most comfortable spaces on property. It has a large stone fireplace, beautiful reclaimed hardwood floors, a complete kitchen, and comfortable seating for a relaxed informal meeting. This meeting space has flexible set up options to suit all your group’s needs. There is a full kitchen available. 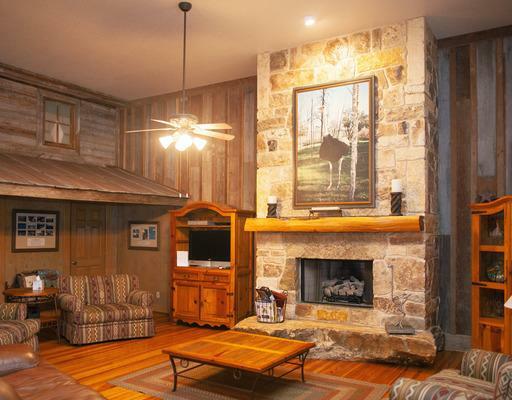 The meeting room and kitchen are in the center of Bluebonnet Lodge. This space can only be reserved when rooms in Bluebonnet are also booked. This gathering space has an incredible entry, beautiful stone fireplace, reclaimed hardwood floors, comfortable seating, a kitchenette, and décor that pays tribute to our historic past—Chisholm Trail Ostrich Farm. This space is available only when lodging is also booked in Big Bird. The Chapel in the Woods is a replica of a 100-year-old church building. Furnishings include a 100-year-old bell, lectern, historic pews, 113-year-old organ, and replicas of 75-year-old stained glass windows. It’s a perfect place for quiet meditation or a small wedding. Both of our dining rooms are furnished with antique tables, chairs and a historic Summers Mill feel. Hillside Dining Room accommodates approximately 100 guests and The Texas Dining Room seats approximately 50 guests. Your events can be catered by MC3 Catering, and meals are served in the Hillside or Texas Dining Room.